where the output variables of interest, , can be influenced by other input variables, , which are determined outside of the system of interest. The variables are referred to as dependent, response, or endogenous variables, and the variables are referred to as independent, input, predictor, regressor, or exogenous variables. The unobserved noise variables, , are a vector white noise process. 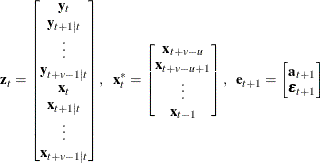 are matrix polynomials in in the backshift operator, such that , the and are matrices, and the are matrices. , , which is positive-definite, and for . For stationarity and invertibility of the VARMAX process, the roots of and are outside the unit circle. The exogenous (independent) variables are not correlated with residuals , . The exogenous variables can be stochastic or nonstochastic. When the exogenous variables are stochastic and their future values are unknown, forecasts of these future values are needed to forecast the future values of the endogenous (dependent) variables. On occasion, future values of the exogenous variables can be assumed to be known because they are deterministic variables. The VARMAX procedure assumes that the exogenous variables are nonstochastic if future values are available in the input data set. Otherwise, the exogenous variables are assumed to be stochastic and their future values are forecasted by assuming that they follow the VARMA(p,q) model, prior to forecasting the endogenous variables, where p and q are the same as in the VARMAX(p,q,s) model. where and are matrix polynomials in , and the and are matrices. Without loss of generality, the AR and MA orders can be taken to be the same as the VARMAX(p,q,s) model, and and are independent white noise processes. 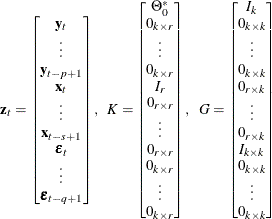 Note that the matrix and the input vector are defined only when .